Voted the UK’s best tribute act in 2017, and stars of BBC 1’s Even Better than the real Thing, Little Fix have wowed crowds all over the UK. After selling out Airdrie Town Hall to over 500 fans in both 2016, 2017 and 2018, the girls return with an all new show for 2019 as part of their UK Theatre Tour. Little Fix are the most accurate Little Mix tribute act to girl super group, Little Mix on the market. Since Little Mix formed in front of our very own eyes on the X Factor in 2011, they have become the biggest girl group on the planet and have churned out amazing chart hits such as Wings, DNA, Change Your Life, Move, How You Doin and Black Magic to name a few. 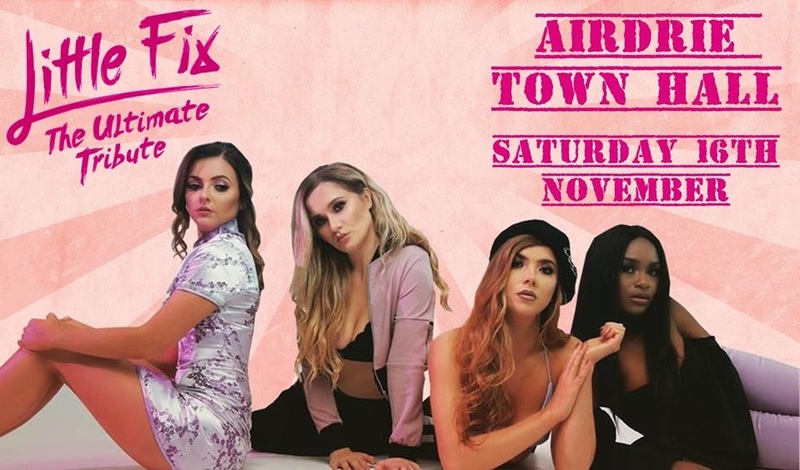 Little Fix deliver a high energy show and replicate the energy, stage presence and vocal abilities of the original group with stunning stage outfits to match. The band power through all of Little Mixes biggest hits with identical choreography and vocal finesse proving that girl power is back on the agenda. The show is brought to you by Airdrie Supporters Trust, with all proceeds going to their Football For Everyone programme.